Honestly, women can never have too much jewellery right? Some like colourful, a little sparkle of diamonds others just like their jewellery natural. All of these unusual titanium jewellery pieces are also hypoallergenic and can be happily worn every day without any reactions to your skin which is a bit of a bonus. We will be taking Christmas orders right up until the 22nd December which sent by Special Delivery will arrive on time. Take a look at our list of women’s jewellery for some more inspiration. This is a hard job, isn’t it? Men usually have everything already and find themselves with an endless supply of socks and bars of chocolate. Do you find men always hard to buy Christmas gifts for? I always look for the men’s gifts first and treat myself to something along the way also ;-). Whether you are buying gifts for someone sporty, often in a suit, loves colour or is allergic to precious metals we will have just the gift for you. Take a look at our list of men’s jewellery for some more inspiration. Only last week someone explained to us that their wife could no longer wear gold jewellery. They would love to wear an engagement ring again. They love the style of the ring they had been proposed to; it had a lot of sentimental value. As titanium is hypoallergenic, could we replicate their engagement ring using their aquamarine and diamonds? The style of their traditional engagement ring is not something we had ever attempted to make before, but we like a challenge! After emailing us images they sent their gold ring into us so we could copy it and use their original stones. Titanium cannot be soldered like silver, gold and platinum can. A traditional style three stone claw set ring like this is not an easy piece to make. It is completely handmade and a time-consuming process. The band has to be carved by hand using files from a solid rod of titanium and each claw had to be carefully laser welded together. We think we did a pretty good job, don’t you? A lucky lady who hasn’t been able to wear jewellery for some time can now enjoy her engagement ring again. Contact us to remake your engagement ring. Send us an email using the contact form and we’ll get back in touch. There’s nothing more irritating than receiving an online purchase, whether you have bought clothes, jewellery or something for your house to realise it’s not the right size and it’s not what you thought you were buying. Or you have problems finding bangles that fit your wrists? Do you have a smaller or larger than average size wrist? We have written a guide on how to measure your wrist for a bangle to solve this problem. Choose from 3 sizes of bangles when buying from Ti2 Titanium. They are all suitable for men and women to wear between the sizes of 60mm to 70mm. As a special request, we can often offer sizes which err on either side of these measurements. Please send us an email to see if this is possible. Making our bangles from large tubes of titanium; they are cut open, hand formed into torque bangles and hammered into each design. We make each bangle to order, specifically for you. It’s for this reason we are not able to alter the size easily, often needing a new bangle to be made. The measurements 60-70mm are the inside diameters of the bangle at the widest point as the image above shows. Our advice would be to lay your hand on top of a ruler and measure the width of your wrist. Choose the nearest measurement to buy your bangle. You do not want the bangle to fit too tightly, make sure there is room for movement! Alternatively, download this file and print it out to scale on your printer. Do you have more questions on how to measure your wrist for a bangle? Please get in contact. Our titanium jewellery is handmade in the UK. We can design and made something especially for you. We love a challenge and are happy to help. We have now created a relaxing showroom for you to visit Ti2 Titanium in Wiltshire. Take a tour around the workshop. 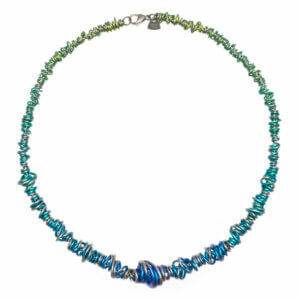 Learn how titanium jewellery is made and coloured and have the opportunity to ask questions you have about titanium. Experience how we work and handcraft your jewellery, take your time to look through our collections and discuss with us what would suit you and your lifestyle best. If you would like rings in gold, platinum or palladium we can also discuss our Contour Wedding Rings. By appointment only to see us on Monday to Fridays please contact us. We are situated on Frome Road, Bradford-on-Avon, opposite the Lock Inn and next to TT Cycles. We are trading as Prism Jewellery Design Ltd with brands Ti2 Titanium and Contour Wedding Rings. Plan to make a day trip to visit us, there is plenty to do in Bradford-on-Avon. Traced back to the Roman origins there are lots of buildings dating from the 17th century which grew due to the thriving woollen textile industry and the influence of Flemish merchants. Further afield you can also visit Bath, Bristol and Salisbury. Hire a bike and cycle down the Kennet and Avon Canal Tow Path with TT Cycles. Alternatively take a nice long walk instead. For the full Bradford-on-Avon experience, hire a canal boat for the day with Sally Narrow Boats. Visit Tithe Barn. See the spectacular 14th century monastic stone barn, 51 metres long, with an amazing timber cruck roof. Historic Town Bridge and Lock-up. Built early in the 14th century to replace the broad ford that gives the town its name. As far back as 1400 there have been records of Bradford-on-Avon. Two arches of that bridge remain. Most of it today dates from an 18th century rebuild and doubling in width. St Laurence Saxon Church was founded by Saint Aldhelm in 700. Architectural style suggests a 10th or 11th-century date. St Laurence stands on rising ground close to the larger Norman parish church of the Holy Trinity. The church was rediscovered in 1856 and was restored in 1870–80 and 1952. Chapel of St Mary Tory The chapel of St Mary Tory is magnificently placed on a site overlooking the town. Also referred to as a hermitage and a pilgrim chapel it is on the pilgrim route between Glastonbury and Malmesbury. Bradford-on-Avon Museum is a small volunteer-run museum of the natural and historic heritage of the town of Bradford on Avon and also includes the villages around it. Just next to Tithe Barn is a collection of Resident Artists, Craft Workers and Restorers in a range of Arts, Crafts and Antiques Tithe Barn Workshops. There is even a small tea room to enjoy the tranquil gardens. Take a walk towards the town centre where you will find plenty of independent shops along The Shambles, Silver Street and Market Street. Organise a little holiday and take a look at the list of Hotels, Cottages and lodges. New years Resolution Competition Dream it. Wish it. Do it. January is that time of year when everyone makes a list of new years resolutions, some often more achievable than others but with a view of improving your life and feeling some achievement. Join in on our DREAM IT. WISH IT. DO IT facebook competition to keep inspired; hearing other people’s own resolutions and aims. Some of you have pretty big challenges this year and will feel very proud when you get to your milestones. Join our Facebook page, Like this image and comment on what your New Year Resolution is for 2017 for a chance to win this titanium bangle engraved Dream it. Wish it. Do it. See what other people’s resolutions are and maybe give them a little encouragement too! Sharing is caring, share to your friends also so they can join in too. At Ti2 Titanium we have a few goals of our own. Four of us (Lorraine, Ruth, Aimee and Hayley) are joining in on the 5k Bath Color Obstacle Rush in July for a charity yet to be decided. And our Director Barry Milburn is challenging himself to do #Walk1000Miles with LiveForTheOutdoors.com. Walking a minimum of 2.74 miles per day over the year whilst tracking your progress with others. Lorraine also has a potential Aquathon and a Triathalon, we all have healthy and active intentions here this year! Wishing you all the best of luck with your New Year’s Resolutions and a healthy, prosperous and a happy 2017! “I have enough jewellery” said no woman ever! Have you left your Christmas shopping to the last minute? Well don’t panic, she will love titanium jewellery. Titanium is 100% Hypoallergenic so our earrings will be just the present if your Wife, Mother or Sister cannot wear earrings usually. Perfect for any occasion, colourful and fun. Our women’s titanium jewellery will make a special Christmas gift. Take a look at our selection of women’s gifts. Are you looking for an original Christmas present for your Dad, Husband or Brother? Take a look at our men’s jewellery Christmas gift guide. Titanium is strong, light-weight and durable making this the perfect present for active men. To celebrate the start of the 2016 Paralympics we have discovered a few sports people who are using titanium to help them become the amazing sports people they are. Eleven years ago, after Masaki Fujita lost both legs in an auto accident, he visited Saito’s workplace. Fujita was looking for a prosthetic he could use for competing in the triathlon. Saito was intrigued because it was still a time when maybe only one in 100 people would inquire about a prosthetic for use in sports. Having never made a prosthetic for cycling, Saito started from scratch. He first tried fiddling with a prosthetic for daily use, but the spring that made it easier to walk was too flexible when pedaling and energy was not directly transmitted. Both Fujita and Saito agreed that the prosthetic did not have to have a shape exactly like a human leg as long as it had the ability to pedal the bicycle. The results came soon enough as Fujita won three medals at the Beijing Paralympics. For the London Paralympics, titanium was used for the foot part to increase durability and lighten the weight. Once again, Fujita won a medal. Jay LaPointe, who lives in Las Vegas, Nevada, was given a 3% chance that he would walk or feed himself again after crashing during a motocross training ride on June 10th 2004. At the time he was a successful racer aiming to become a professional. After breaking three converted carbon fiber bicycle frames in quick succession, LaPointe concluded that the particular frame stresses when cornering required a different approach, and he started looking at custom-made options with metal as the material. LaPointe approached www.wittson.com, a company that specialises in custom titanium bikes, to build him a bespoke machine. “Having a custom trike has made a huge difference in not just competing but everyday training rides have become easier as well,” he says. LaPointe says the frame shape itself was the main adaptation, along with Shimano Di2 electronic shifters because the function in his right hand is “pretty much zero”. “The most obvious [adaptation] is the sloping top tube, which not only helps me not hit my knee repeatedly but also allows me to be able to dismount my trike much easier when I have a flat tire or to do something as simple as getting more water at the store,” he says. Frame builder, Mindaugas Zukauskas, told road.cc this is the first titanium trike Wittson have built. … Continue reading England Rugby Star and Prism on the Winning Team!